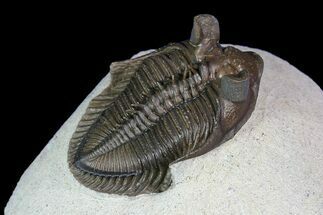 This is a beautifully, prepared Walliserops trilobite from a very unusual locality Msissi, Morocco. Nearly all of the Walliserops you see on the market are collected near Foum Zguid. 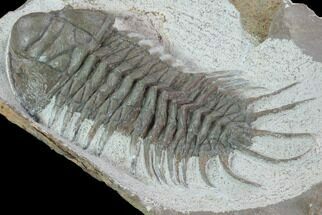 This specimen has a much shorter fork, and might be considered a different species from Walliserops trifurcatus. 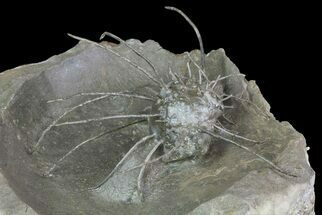 The specimen is 2.25" long including the forked rostrum. It's wonderfully prepared with nearly 50 small, free-spines. There is beautiful eye facet preservation in this specimen. Less than 1% shell restoration along repaired cracks. 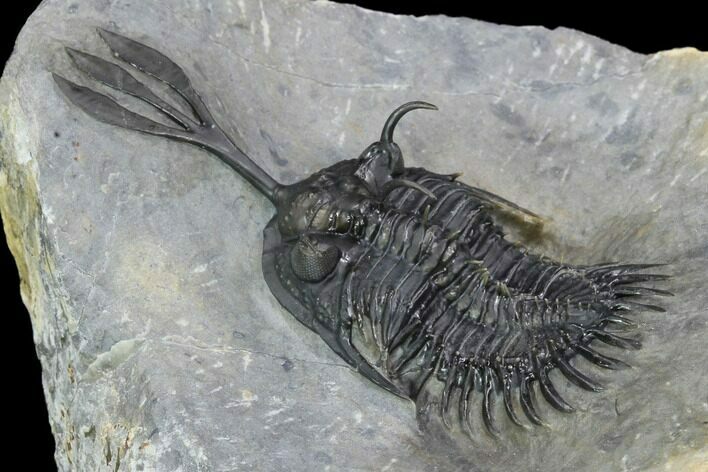 Walliserops is a fascinating, ancient arthropod that scoured the bottom of a shallow sea floor. 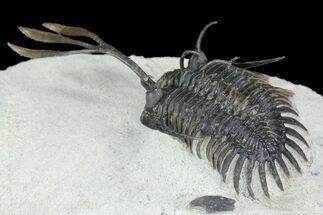 It is placed in a genus of spiny, phacopid (acastid) trilobites and it is found in Lower to Middle Devonian (441-358 mya) rocks from Morocco. All species of Walliserops share the spectacular three-pronged "trident" that rises from the glabella. They also have horns over their eyes and intimidating spines along the back. 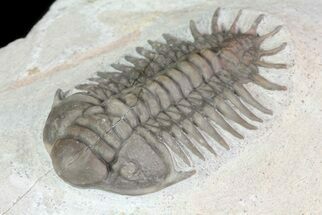 Walliserops was highly specialized to deal with an oceanic wonderland in the diverse and dangerous, Age of Fish. 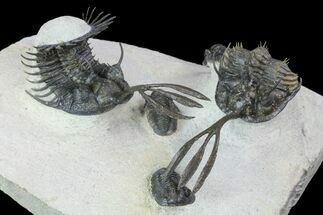 Specialization is a key difference from the more primitive “bugs” that emerged in the Cambrian. 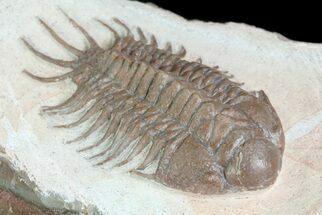 Walliserops displays an unusual departure from bilateral symmetry . An example is the curved occipital spine of W. hammii which takes a noticeable curl to one side. The regular development of these features in multiple specimens suggests a genetically controlled feature of the genus and not mutations or pathology. Some exceptions to bilateral symmetry can be explained by adaptations which allowed the trident to be held off the sea floor while walking. The function of the trident is an intriguing mystery. Many believe it was used to stir the ocean floor to better scavenge for food. Such a large adornment would have required significant energy and nutrient investment. Although a number of suggestions have been made (e.g. sensory apparatus, disguise or protection), many experts support an idea that the trident served as "horns" similar to present day beetles. Morroco is an exciting place for discovering new and diverse species that lived in an ancient ocean that covered the northern reaches of the Sahara Desert. 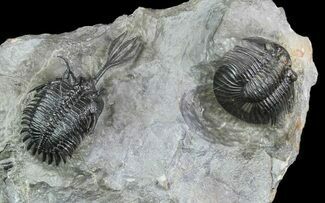 All three currently described species come from the same strata near Foum Zguid in southern Morocco, though other locations have yielded new trilobites to study. 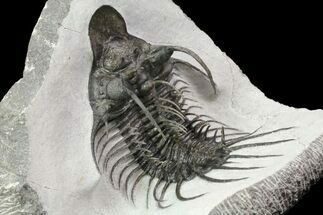 This region is hailed as one of the great fossil treasure troves in the world..